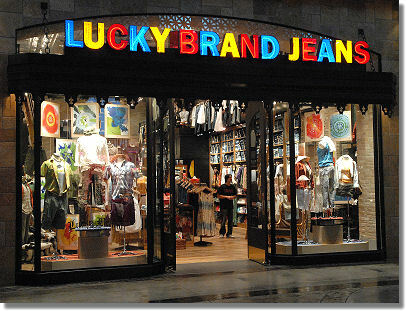 The store design tell you that the retailer is inspired by vintage style and very into Americana. They cater to a very specific group of young adults, but the environment makes that group anxious to come back for more. The store’s target customer is both men and women in their 20s and 30s, who appreciate both current trends and vintage style. For the most part, yes. However, a lot of the racks are jam-packed with merchandise (the thick wooden hangers, although very pretty, don’t help the space issue much) and some of the shelves holding folded clothing were much too high for this 5’3″ girl to reach unless I was rocking some stilettos. I guess next time I’ll come prepared. Is it stock piled minimalist? Stock piled. Very, very stock piled. However, that is to be expect from a store whose parent company is Forever 21. The fixtures definitely suit the store environment. It’s a mixture of the expected, such as metal racks and wooden shelving, and the unexpected, such as vintage suitcases on the floor overflowing with scarves and belts. Is the ambience fitting for the store’s image? The ambience is very fitting for the store’s image. They decorated with old suitcases, antique books, quirky mannequin heads, offbeat lamps, and vintage photo frames, full of modern people portraying the lifestyle of their target customer (or the lifestyle they want). Every aspect of the store seemed to be such a quirky mix of old and new. Overall, the store has minimal lighting and is pretty dark in most areas. The displays throughout the store, however are well-lit with task lighting. The store is painted mostly dark blue, with wooden fixtures and flooring, and a few accent walls in bright orange with white trim. Honestly, I never would have entered this store in the first place if it wasn’t for their amazing windows. 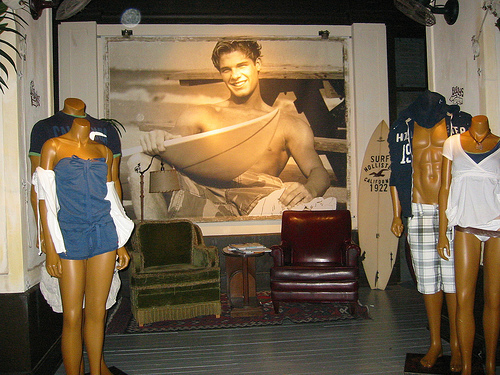 There are window displays on either side of the entrance which are typical and contain three mannequins each (one for women, the other for men) with an American flag as the backdrop to each. There are two ways to enter the store, with the entry ways divided by a third display in which mannequins are set on top of old books. On the other side of each entry way is another display and behind the glass are red, white, and blue buttons (think “Vote for Obama!” versus “Oh crap, my sweater is missing a button”), hundreds and hundreds of buttons, filling the entire window floor to ceiling. I can’t even explain how awesome it is. The only thing I would change about the store is how much they pack on each rack, much like their parent store Forever 21. although it’s a lot cleaner at Heritage 1981 than Forever 21, it’s still difficult to shop with the racks as full as they are. Thanks Jennifer for turning in a great assignment this week. Job well done! I have given my students a Store Study assignment. 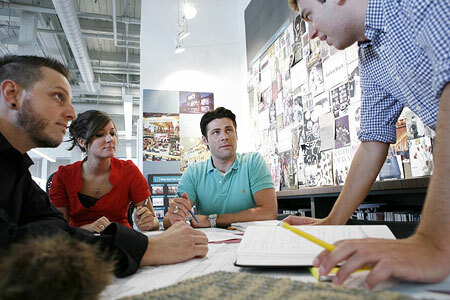 They are to visit various establishments and answer questions based on the principles of visual merchandising. This assignment is to be turned in weekly. 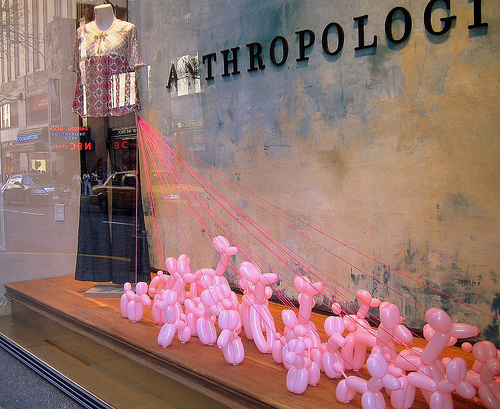 Anthropologie is one of those stores where many of my students have chosen to complete this assignment. So many, that I have imposed a moratorium on that store! Only for the sake of this assignment. But I can understand why so many of my students are drawn to it. It is beautiful work done well. I am always inspired by the work of their display artists. Everything forms a cohesive story: the store design, merchandise, even the catalogs, it’s no wonder they have such a devoted loyal following of design aficionados who love the store just for the store alone. That is what every retailer wants. I would encourage you to take a stroll through one of their establishments if you get a chance. They are a classic example of what you can do with a little money and a lot imagination! So we’ve discussed what is store design and why it is so important. Now let’s look at how it all comes together. You’ve fond the spot of where you wish to open your store but how do you turn your dream location into your ideal store. Like all construction you begin with the architect or a designer. This individual will work with the store owner in coming with a concept fitting to the owner’s ideas. I wouldn’t just pick any random person out of the phone book. I would look around first at other stores and research who did want. It’s no different from hiring an architect to design your dream home, like residential design, architects in commercial work also have a signature style. Be prepared with as much information as possible to give to your designer, especially in regards to what kind of merchandise will be sold! You wouldn’t exactly want an architect to design a store interior with lots of sharp, square, pointy, edges in a monochromatic color scheme if you are selling children clothes and toys! Don’t forget to discuss the forgotten area: stockrooms, dressing rooms, office space, and the cash register. So often we focus on the “outside look” of the store we forget about the inner workings. These areas are your store’s backbone and you need to make sure you allocate space for them. I had a client once who was so focused on her merchandise and fixtures she forgot to carve out a space for the cash wrap area. Since it was a high-end home furnishings store I assumed she was going to use her office desk to make the sales transaction. That was not what she had in mind, she had wanted an actual cash wrap area, but had failed to tell me to put it in the design. I too take responsibility for not asking. A lesson learned for both of us! Based on the store design alone, can you name this store? It doesn’t take a whole lot of money to have a good design. Some of the most creative spaces had very limited budgets. Resources and imagination come into play, which is why we chose this field in the first place! Independent stores can certainly take more risks than chain and department stores. Remember the main purpose of store design is to showcase the merchandise! Click on the link above to read the complete article. I’m glad to see working professionals educating the next generation by utilizing their talents, because they have so much to offer. Store design is what unites all aspects of visual merchandising. Before a visual merchandiser can work their magic with displays the design of the store should have at least already conveyed the message of what kind of store it is. Depending on the size of your store and who you work for; the visual merchandising manager (sometimes the creative director) will work with the architect and interior designer to come up with a design scheme for the store’s image. It is vitally important the architect has input on the visual merchandiser’s needs and requirements before a store design plan is formulated. What Makes A Good Store Design? -First and foremost a good store design will always show the merchandise off to its best advantage! Why is Store Design Important? The design of the store helps support the brand/image/identity of the retailer. Some retailers have a proven format that helps when opening a store – you know what you’re getting! If a store veered too far off from their image their business could suffer. 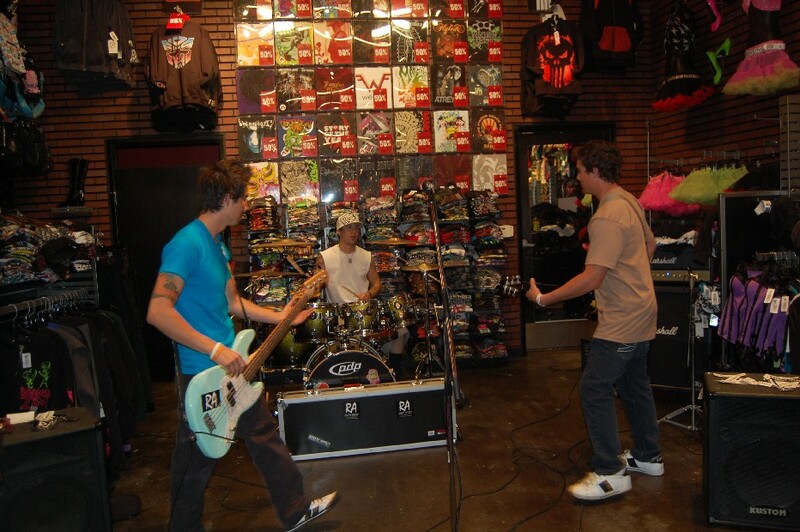 The answer is Hollister and Hot Topic. Two vastly different stores with two vastly different customers! This is why store design is so important. Color Theory is one of the hardest things for me to teach, because it’s a huge topic that can’t be completely covered in three hours. I tell my students I could hold a separate class just on color alone, in fact there are classes just for color! 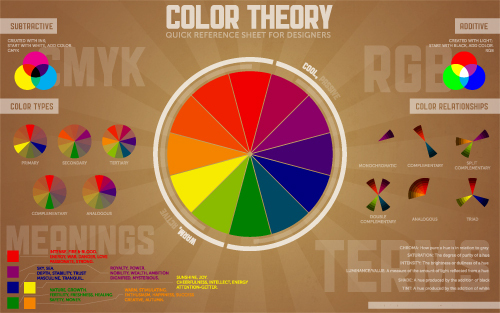 Paperleaf has a color theory poster you can print out for free. There are various sizes of this poster you can print out. I would recommend it not only for my students but for any design professional. The role of the visual merchandiser is an ever-changing one. Just as brands exist within a store, the stores themselves have become brands. You don’t expect to see the same merchandise at JC Penney as you would at Barneys? This is important for the visual merchandiser because you are given the task of communicating the store’s image through your displays. And this is becoming harder for us to do. Why? 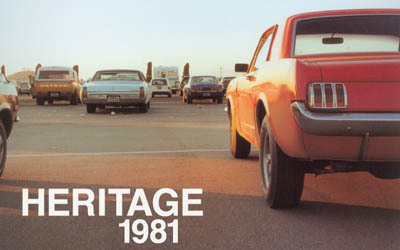 Because we are being faced with unprecedented competition, retailers didn’t have years ago. Brick and mortar retailers are facing one of the biggest challenges to traditional shopping. Any idea on what that is? Retailers are under a lot of pressure to attract and keep customers coming into their stores when shopping from home has become so convenient and price competitive. Visual merchandisers are key in attracting and keeping a customer’s attention. 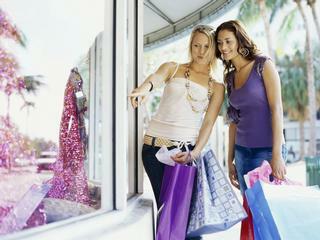 Luckily shopping is a social activity and many people do like to go out just to see what’s new! I for one am one of those persons, and I know many others are too. I was working for a department store in San Francisco as a trimmer, a term also used to describe display people. I was the lead stylist in charge of dressing all the mannequins and helping with set design as needed. We had a carpenter on our team who could build whatever idea we came up with as far as backdrops or props. He was amazing! I use to watch him work and one day asked him, where and how did he learn to build stuff? He told me he started out as a carpenter apprentice and slowly worked his way up from there. This intrigued me, as I always had lots of ideas but not the skills to execute them. I asked him if that was something a girl could do? That was a serious question, as I had NEVER seen a girl in construction! He laughed at me (of course) and said yes. He gave me some tips on how to get into construction and the rest is history. Once I got into “the trades”, as it is often referred to, I thought I would immediately go back into visual display work after six months of doing hard labor. I just wanted to learn how to build so all my designs could come to life. Construction ended up surprising me, so once I got in I stayed! I went through a four-year carpenter apprenticeship training and school, journeyed out (another trade term), and immediately acquired my general contractor – B class, license. I can design it and build it! Today when people ask me what can I build, I say what can’t I build! This is not to brag, but to show that in order for me to continue doing what I love and progress in my career, I had to add more “skills” to my resumé. 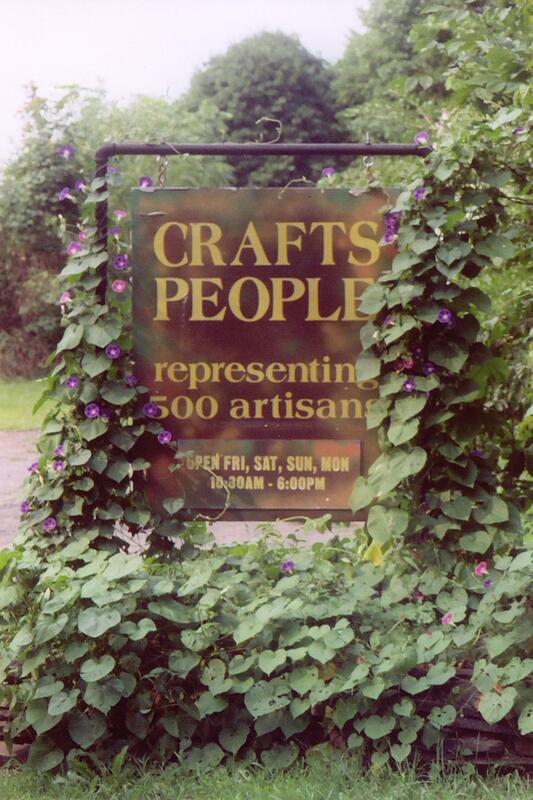 Various arts and crafts: candle-making, soap-making, knitting, mosaics, wood-working, etc….. I also want you to study the principles of interior design. You will hear me say over and over. : If you can decorate a room, you can decorate a store or window. 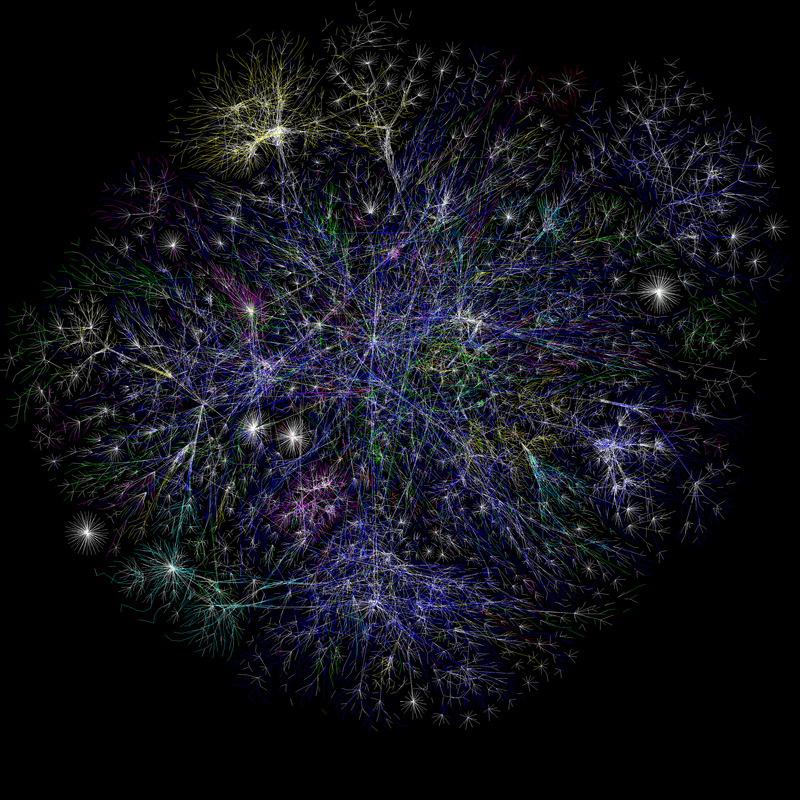 Many of the people in our field do cross-over into different fields. What’s to stop a window dresser from set decorating on a movie? Can you organize the placements of the tables, fixtures, artwork, and displays for a showroom floor; well then I think you could do the same for special occasion event as well? If you can style a mannequin for a window in a chic, well put together outfit, then you can style a model for a photo shoot. Johnathan Adler is one of my favorite examples of this. He is a potter/ceramic designer who does amazing interiors as well! Don’t be limited into thinking you can ONLY do one thing. Remember you are only as limited as your imagination will take you! Our job requires us to step back and see the big picture, I want you to do that with your life as well! Improvements in technology and with major fashion houses having unlimited budgets, window dressing has grown into massive productions of display. You will have a team of craftspeople working in their specific trade to help put it all together: carpenters, painters, electricians, stylists, florists, maybe an artist or craftsperson with a specialized skill – “it takes a village”, as they say! And all of these things push the boundaries for visual display. What most people not in our industry don’t realize is it takes months, and months of planning before a window is installed. Christmas windows are being planned a year in advance – I’m not exaggerating! Stores have to know ahead of time when they will be having “Sales” so the proper signage/banners/displays can be in place. Although this job is a lot about creativity it also takes a lot of organization and planning as well. It’s great to be a talented decorator, but you will also need to be focused and have good time management skills; because today there is nothing you can’t do in our line of work. You can go as far as your imagination will take you!